Coming up with a list of the best SUVs in Canada can be a tricky proposition for us. Go Auto sells most of the top SUVs on the market, so it wouldn’t be outrageous for someone to accuse us of stuffing the list full of Go Auto brands. Which—full disclosure—we totally did. The five SUVs that made the list are all available for purchase right now on GoAuto.ca. In order to be as unbiased as possible, this Top 5 list was compiled based on rankings from Edmunds, Car and Driver, US News, Wheels.ca, and CarMax sales data. These are the most awarded, highly-rated, and best-selling SUVs on the market right now. Period. The undisputed king of off-road isn’t just about boulders and mud anymore. Thanks to some modern tech advancements—especially on lower, less expensive trims—the 2019 Jeep Wrangler is a capable all-around SUV in its own right. With collision detection, adaptive cruise, and automatic emergency braking, the Wrangler is now the utility vehicle of choice for traditional fans of the 4Runner and the Chevy Colorado. Perhaps the biggest advancement in the Wrangler’s game is its fuel economy numbers. Its no longer chugging along at 13-14 L/100 KM, which makes the Wrangler more city-friendly than ever before. If you’re looking for the best bang for your buck, the Sport S trim is probably the way to go. It’s just a step up, price-wise, from the base trim and adds a few must-have features in a 2019 vehicle: namely remote lock/unlock, air conditioning, and power windows. If you’re the rough and tumble type, the Rubicon is still your best option. Want to learn more about the 2019 Jeep Wrangler? Click here. The RAV4 is the best-selling passage vehicle south of the border, and that’s not likely to change. A powerful new redesign gives the 2019 RAV4 an imposing look, and in an age of relatively indistinguishable SUVs, it stands out in a great way. The RAV4 now comes with Apple CarPlay and Amazon Alex integration, and the new Toyota Safety Sense 2.0 system is standard across all trims. This gives you full-speed dynamic radar cruise control, lane departure alert with steering assist and road edge detection, a pre-collision system with pedestrian and bicycle detection, lane tracing assist, and more. The driver aid package offered in the 2019 RAV4 is one of the most comprehensive out there, even among the best SUVs in Canada. Overall, the RAV4 is a perfect family SUV with a great interior. It offers a very smooth ride and all the utility you’ll need to both work and play, whether you’ve got kids or dogs or a rowdy group of dude bros. If you’re looking to do a bit of off-roading, the Trail trim is back with more ground clearance. But its moderate engine is what keeps this one from cracking the top 3. 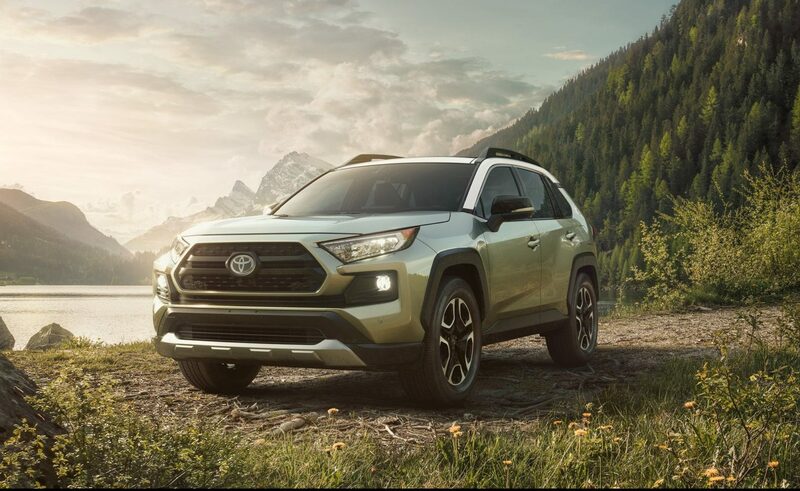 Want to learn more about the 2019 Toyota RAV4? Click here. New to the 2019 Jeep Cherokee is an updated design and a 2.0-litre turbo engine option. It also adds LED lighting, a hands-free power liftgate, and a panoramic sunroof. Tech fans will rejoice this year, too, because the Cherokee has now adopted the Uconnect system with Android Auto and Apple CarPlay integration. The screen can go as large as 8.4 inches, which as big as you’re going to find in the segment. The Cherokee is probably a better option for Jeep fans more inclined to the daily grind of working in the city. It still packs Jeep’s classic off-road punch, but the Cherokee offers a smoother on-road ride than the Wrangler along with a bit more tech. At higher trims, the Cherokee comes with a full suite of advanced safety features. Ultimately, the Cherokee lets Jeep fans have it both ways. Want to learn more about the 2019 Jeep Cherokee? Click here. The 2019 CX-5 appears on pretty much every Best SUV in Canada 2019 list because it’s one of the sportiest SUVs on the market, full stop. This is an SUV that isn’t going to blow you away with its specs. You simply have to book a test drive and drive it yourself. The 2019 CX-5 is incredibly fun to drive, so much so that no one really cares that the 2019 version hasn’t added a ton of stuff over the 2018 model. Make no mistake, the CX-5 is all about how you feel while you’re driving. In addition to the fun, smooth ride it offers, you’ll also be blown away with the interior quality. It’s enough to challenge some luxury vehicles that cost $20,000 more. 2019 CX-5 drivers continue to cite its surround-view parking camera, the new turbocharged engine (optional), and how quiet it remains at highway speeds as reasons to make the jump to the newest model. If you’re looking for cargo space/tons of legroom in the second row, the CX-5 isn’t class-leading in those respects (however, it’s still respectable). But if you’re looking for the best driving experience, the CX-5 is the way to go, hands down. Want to learn more about the 2019 Mazda CX-5? Click here. If you’re surprised to find the 2019 Honda CR-V as #1 on our list of the best SUVs in Canada, it’s only because you’ve never driven one. We assume. The Motor Trend SUV of the Year has tons of space, handles like a champ, and includes all the safety features you need. Surprisingly, it’s still fun to drive. A tight package from the outside, it definitely feels like a mid-size SUV inside. There’s so much to recommend with the CR-V it’s kind of ridiculous. Class-leading cargo space. Class-leading fuel economy. Arguably the strongest infotainment system in its segment. And best of all, it has the most affordable top trim of any SUV on this list. If you’re looking to purchase something on the low-end, we suggest skipping the lowest trim, the LX. It’ll do in a pinch, but the next step up, the EX, offers incredible value for the slight increase in price. It gives you a more powerful engine, it’s more fuel-efficient, and you get a ton of extra features (tech and safety-wise). It’s probably the only trim most people will even need, unless they’re looking for leather seating, which is available in the next trim, the EX-L.
Want to learn more about the 2019 Honda CR-V? Click here. Want to dive a little deeper into the rankings for the best SUVs in Canada? Visit Edmunds, Car and Driver, US News, Wheels.ca, and CarMax.